Five Star Rating Widget is an awesome source of getting feedback and Positive response from your readers, this widget shows 5 stars at the top or below the blog post, where one can rate your blog article. Before this, I used to see this widget mostly on the blogs hosted by Wordpress. Wordpress users can simply do this by using WordPress plugin designed for this. But unfortunately, bloggers like me who host their blogs at blogger.com were unable to add this rating widget, but from today onwards we also use this widget easily on our blogger websites easily just by following below given steps. Smart bloggers always make a backup of their blog templates before editing and making any changes to the template. Here is the guide of how to make backup and restore blogger template before editing. This step is not necessary but still useful in the case if you would make any big mistake in the template then the only way to get back your template is restoring. If you don't have backup of template in advance then you may lose some or full design and scripts of your blog. 4. Now find this tag </head> in your template. To locate easily, you can use CTRL+F keys and type this tag in the search box. You may find this tag more than 4 or 5 times, depend on your template design. In my case, I found 4 times the same tag in one of my private blogs. Note: In my case, I placed this code below the last one of 4 tags I found. If the same does not work for you then you should try by placing the above given code below all of the tags. If you face any difficulty, then this video will guide you better. 7. You can also add this rating widget below the title of post or say at the starting on the post. For this, you have to paste the above given script above <data:post.body/> tag instead of placing below tag. But I would recommend you to add this widget only at the last of the post because readers will find it useful to give ratings only after reading the full post. 8. Now save your template, and you have done it. It will look like this one, shown in below image as a demo of this rating widget. Why I should use this widget? Simple, getting positive feedback from visitors and blog readers enable you to get fame. The Stronger your feedback is the more your blog visitors will be happy. You may have seen those popular sites that mostly depend on post rating for the purpose of image galleries powered by Blogger, review blogs, personal blogs and etc. It provides a quick way to users to provide their opinions with just a simple click. Five Star Rating Widget is an awesome source of getting feedback and Positive response from your readers, this widget shows 5 stars at the top or below the blog post, where one can rate your blog article.This Widget also shows the total number of views of the article along with the number of votes.Your readers can rate an article by Selecting and Clicking the 5 stars at Once. You may also call the rating system a polling system that helps you and your readers to receive and send feedback on content. At last, I'd just say If you are working on the sites based on reviews, image galleries, product specifications then you must use this widget for your website. Actually in the lack of this widget, you are losing the interest of your readers. Also, if you face any problem in installing or adding this widget then please let me know about your issues and problems, I will give my best to sort out the issues. 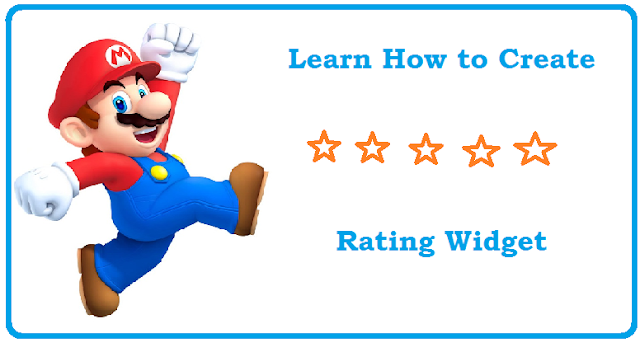 Message: I hope that you have enjoyed 'Create 5 Star Rating Widget for Blogger Website: Step by Step Guide' article. However, if you want me to deliver more articles then please share my post. You can use Social Sharing Widget provided at the end of every post. After all, Sharing is Caring! Thanks it's work. Keep it up.